There has been a lot said and written over the past couple of years about the trouble in the housing industry — and there certainly has been some. More in some places than in others, but we have all felt it. 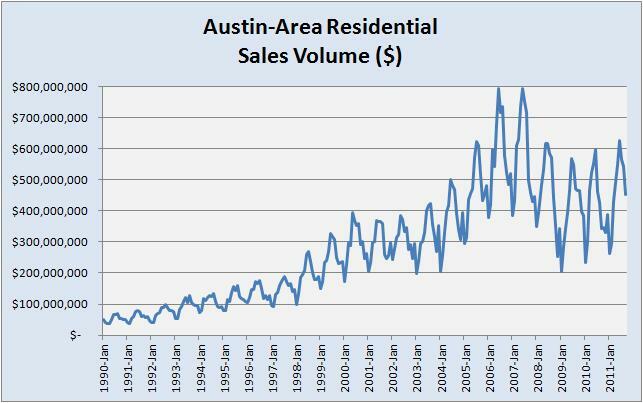 What the chart above points out is that the total dollar value of home sales activity in the Austin metro area over the past 3 or 4 years hasn’t really been unusual, except that it hasn’t been growing. It’s not really down from an historical perspective, though. What was unusual was the bubble that we enjoyed in 2006 and 2007, as did most of the U.S. Our bubble wasn’t as large as some so our fall wasn’t as long, but there is no doubt that a correction took place. The other notable feature in that chart is the distance between the annual highs and lows in 2008 through 2011. There is an obvious upward trend overall during those years, and the shape of this curve in 2011 looks very much like pre-bubble 2005. Year-to-date dollar volume in 2011 (January through September) is just 2% lower than the same period in 2005. Does this mean “happy days are here again?” If that means going back to the boom time of 2006-2007 (or 1998-2000), probably not. We are on the mend, though, and, given continuing uncertainties elsewhere in the world and elsewhere in the U.S. housing market, virtually all forecasts are for continuing growth for Austin and Central Texas.